We were waiting for a clear chance at starting our ascent of Chimney Peak at the col. There was a lot of traffic and we didn't want to impede any hikers' descent. After a few minutes though we realized we wouldn't move for a while if we didn't just force our way through. Philippe decided to climb further left from where people were coming down and I went for a line a little further right. We passed a few people and rejoined with the usual line up the peak when most of the big group was past us. While waiting for the girls to catch up, we watched as some people tried to bypass the climb up Pamola by following a ledge at the col towards Helon Taylor trail. They didn't make it very far before turning back and waiting in line to get up the usual route. 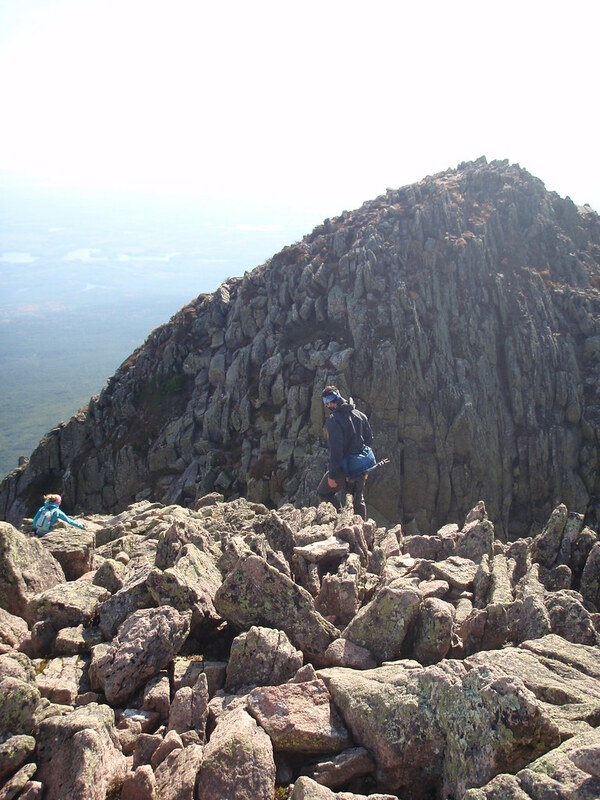 When we were all back together past the tricky scramble, it was a formality to reach Chimney Peak's summit. From there we could see much of our route on the Knife Edge. The view down to Chimney pond was incredible and on the other side of the ridge, we had a very clear sight of the surrounding lakes. The descent on the Knife Edge was exhilarating. Luiza wasn't too comfortable so I stayed close, never further than 10 meters in front. Brigitte had taken off way further as she seemed very at ease. Philippe and Myriam were somewhere in between Brigitte and us. We regrouped on suitable spots a few times but further on we spread over a very long distance. Descending towards the col (photo by Myriam Chênevert). 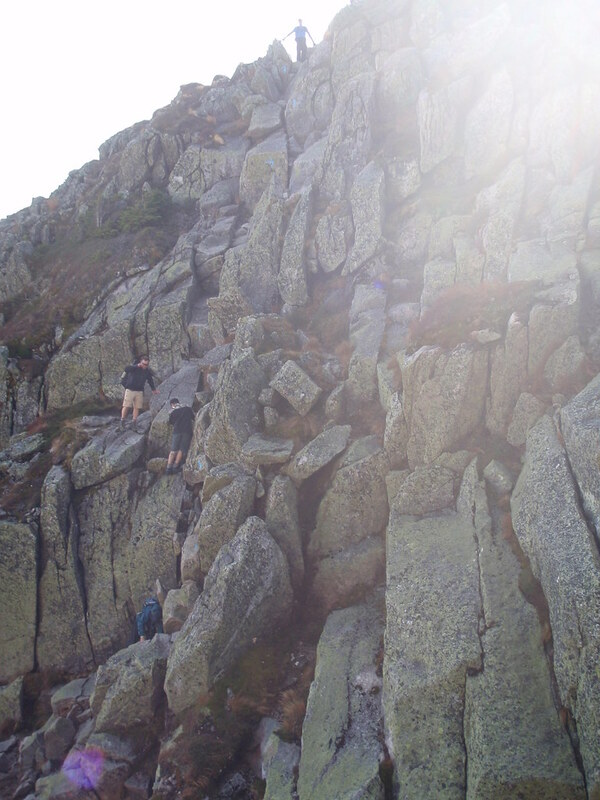 Hikers descending Chimney Peak towards the col (photo by Myriam Chênevert). 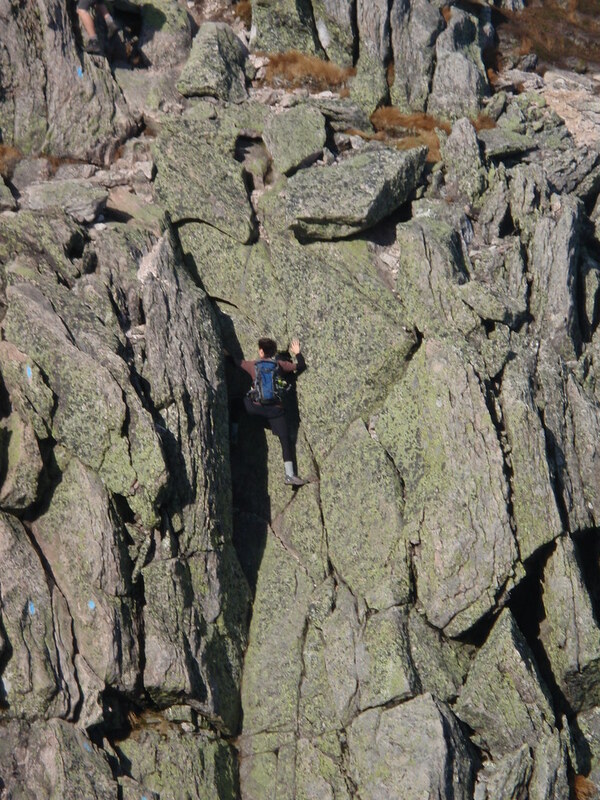 A hiker climbing up an easy dihedral/crack on Pamola (photo by Myriam Chênevert). Exceptional Indian summer the whole time! Note: GPS Tracks may not be accurate, and may not show the best route. Do not follow this route blindly. Conditions change frequently. Use of a GPS unit in the outdoors, even with a pre-loaded track, is no substitute for experience and good judgment. Peakbagger.com accepts NO responsibility or liability from use of this data. This page has been served 1214 times since 2005-01-15.